Hey Everyone! Hope you are all well. It's finally Friday! Yay! Well I mean, yay for those of you who are actually off this weekend. As usual I am working. However I am trying to think as positive as possible because I have lots of exciting things planned for the next couple of weeks. On Sunday evening I am going to the talented Rob Houchen's new EP launch. He played Marius in Les Miserables in the West End and is INSANELY talented. Then on Monday I am going to see Collabro in Southend with one of my closest friends Beki. If you have been following my blog for a while now then you will know how much I adore Collabro. I've been to all their tours and have supported all their individual projects if I can so I am super excited to see them again on this tour as I know they will be absolutely amazing. On Tuesday evening which is Halloween I am going to Big Easy in Covent Garden for a meal and a few drinks with some of my best friends from university and I couldn't be more excited. After a super stressful few weeks at work and home I'm just excited to have a bit of a social life over the next few days. Anyway, enough of that. Today I thought I would do a little bit of a different post for you all today all about music and how I use it to get me through each day of my life. Music is something that has been in my life for absolute ever. From being in my Dad's car listening to music by the Beatles, The Hollies, Dusty Springfield to discovering bands like Westlife, artists like Taylor Swift and even music from the West End, music is just something that has always been there even on my darkest days. So before I beat the record for the longest introduction in the world here's how I use music each and every day for different reasons. A Little Pick Me Up In The Morning - The first thing I do in the morning when I wake up is switch my radio on and I'll either have Heart FM, Capital or Kiss playing. I absolutely love all three of these stations and I just find putting music on first thing in the morning is one of those things that can really help me get out of bed because I do tend to be one of those people that doesn't move in the morning unless I absolutely have to. I definitely find putting music on first thing is definitely one of those things that can slowly transform you into a morning person. No word of a lie! On Long Journeys (public transport, long plane rides etc) - The other day I had to go up to London to pick up my visas for going to China next month and I left my headphones at home and you've no idea how much of a torture that is. I've got two pair of iPhone headphones and since then I always keep one in my bag as I never want to go through that again. I just find that having music with you on long journey not only helps keep you sane but can also help a long journey feel a lot quicker. I always create different playlists for long car or plane journeys as I find they can really help. It's important to have an amazing playlist. Gym & Exercise Motivation - I'm not really a gym person. However I am slowly becoming better and I am going a lot more regularly. Normally on my days off or evenings when I'm not really doing a lot. I will definitely never be one of those people who goes to the gym early in the morning. Whether I am going for a run or to the actual gym music is definitely the motivation that I need to help me achieve my goals and really does help whip me into gear. Currently obsession for the gym is 'Power' by Little Mix. Ultimate motivating song. I also find that listening to any of the playlists on the workout section of spotify also really helpful and motivating. Blogging/Work Motivation - I have always been one of those people that has needed music to help me when it comes to work, school and even blogging. I was never able to revise or do an assignment at school or university without music playing in the background even if it was very soft and quiet in the background. It just helps me focus and concentrate more and again it's a great motivation tool as well. The Soundtrack To My Skincare/Pamper Routine - Is there anything better than having a bit of a pamper night with the best new tunes playing in the background. I always tend to do my pamper nights when there is nobody at home. I tend to just turn up the volume on my phone or stereo (yes I still have a stereo) and just sing along (very badly) to the songs at the top of my lungs. It always helps me relax. Right now I'm obsessed with Havana by Camilla Cabello. So good! To Help Calm Me Down - On days where I am perhaps feeling a little sad and upset (most of you will know I suffer from anxiety and depression) I always tend to put music on however I always find this very hit and miss. When I listen to music I always get very involved in the lyrics and a song can either help me completely or make me cry buckets which in itself tends to be a good thing as I get all that emotion out and can then just start all over. In my opinion I just think music is the best thing for helping with anything like nerves, anxiety or even if you're just having a bad day and don't think anything can make it better just pop on your favorite music and I can guarantee that you will feel a little bit better. I find listening to a bit of musical theater helps me and some of my favorite albums are by the lovely Collabro. They have three albums out filled with musical theater goodness that I'd highly recommend as not only do they have beautiful songs on them but the voices are just so beautiful and will definitely calm you right down. To Help Me Sleep - I cannot sleep without a film playing on my laptop or music in the background. I just cannot sleep without some form of music playing. It just relaxes and de-stresses me. It really annoys me parents because sometimes they think there is someone singing in the house that's not meant to be there. Oops. So there we have it. Just a list of the way music helps me go about my everyday life. Like I mentioned at the beginning of this post music is just a huge part of my life, as I'm sure it is for those of you who are reading this post. We literally can't go through life without it and no matter how you are feeling or where you are at that particular moment in time music will always be there. This post is getting a little bit sappy now so I'll end the post there. Music does wonders for my mood and definitely helps me be that little bit more productive. I tend to listen to spotify for all my music so if you are interested in seeing the kind of music I listen to be sure to head on over to 'Fleur Danielle Griffin'. Are you a music lover like me? How does it help you with your own everyday life? Let me know in the comments below and I'll speak to you in my next post. Hey Everyone, I hope you are all well. So today I have had an extremely busy day. I won't get into too much detail because I don't want to bore you but as you are reading this I am currently on my way back home from London after heading to the Chinese Visa Application Centre. My Mum, Aunt and I have all decided to go on a 10 day trip to Shanghai and even though the initial process of visa applications has been extremely stressful I am just so super excited to finally go there next month. Yes I know I am leaving the visa application a little late but I'm still giving myself enough time at the same time if that makes any sense. Anyway, enough rambling let's get straight into the point of today's post. 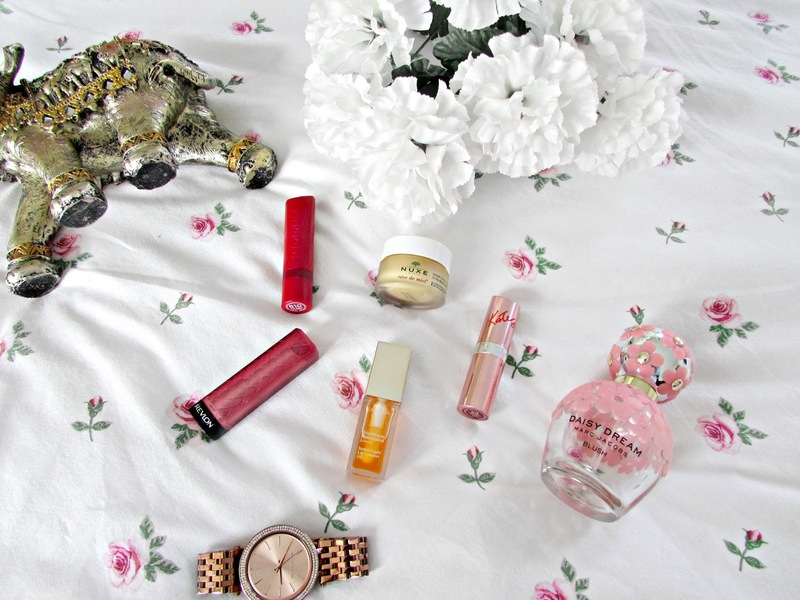 Today I thought that I would tell you of my favorite absolutely favorite lip products to use. 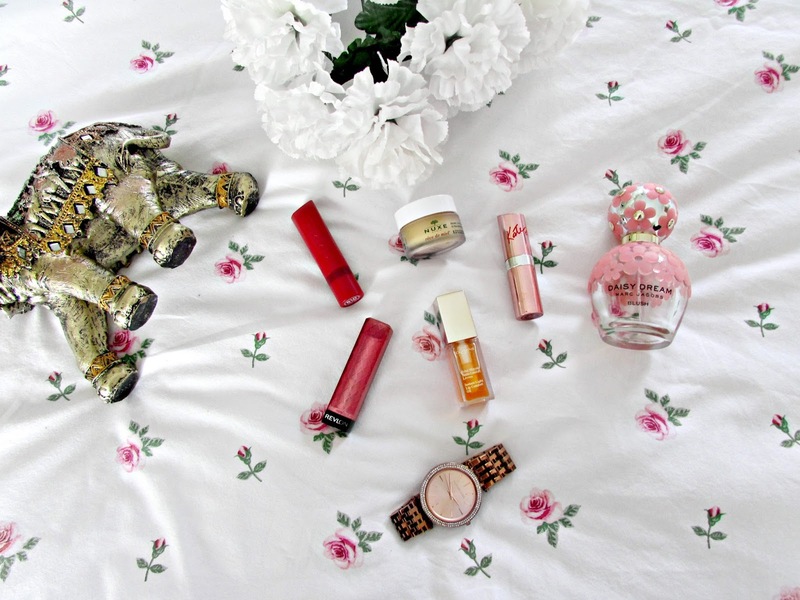 In this post you'll see balms, lipsticks, lip butters and lip oils and they are all things I use pretty much every day to keep my lips in tip top condition. So without further ado, let's get straight into it. 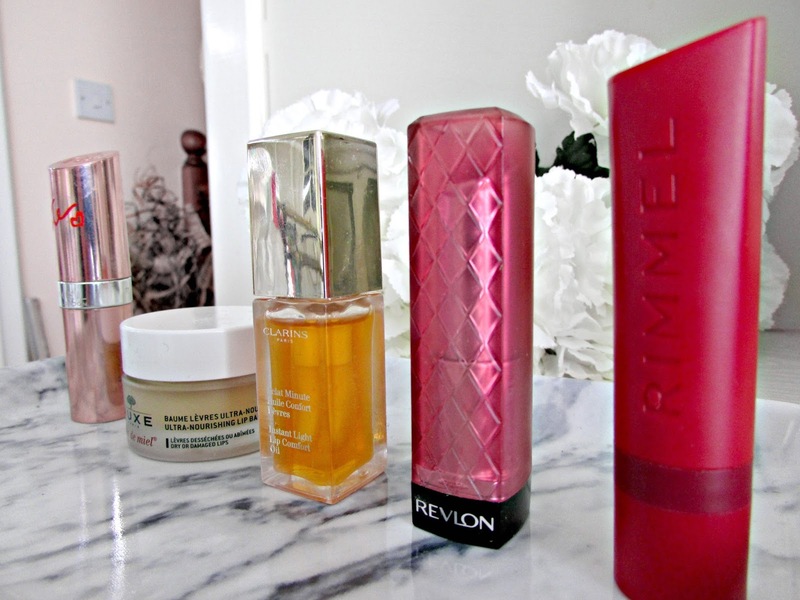 So as you can see from the photo above some of my favorite lip products are from Rimmel, Clarins, Nuxe and Revlon. I always love mixing a bit of high end with low end products and vice versa as to be completely honest what you can find in the high street very often trumps the products that you can get for double the price from a high end brand. 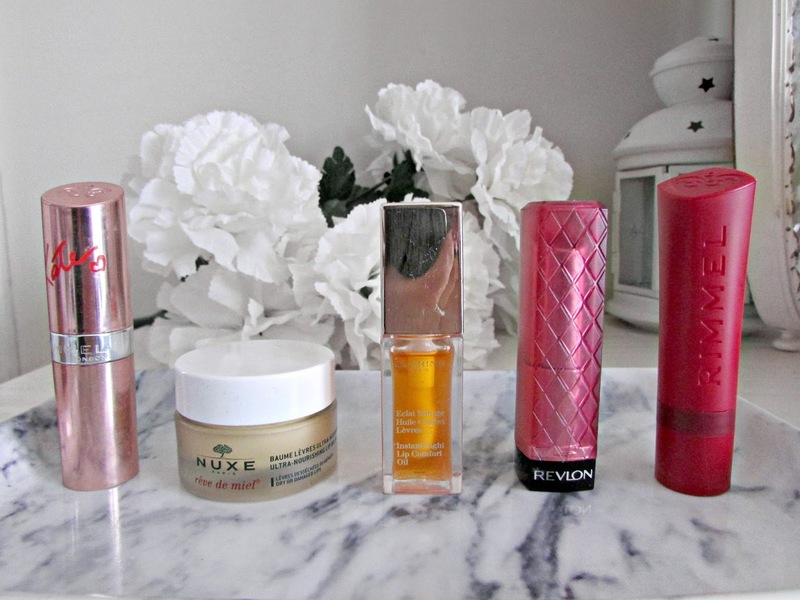 This is from my personal experience anyway however the two high end products that are mentioned here are definitely two of my all time favorite beauty products ever. 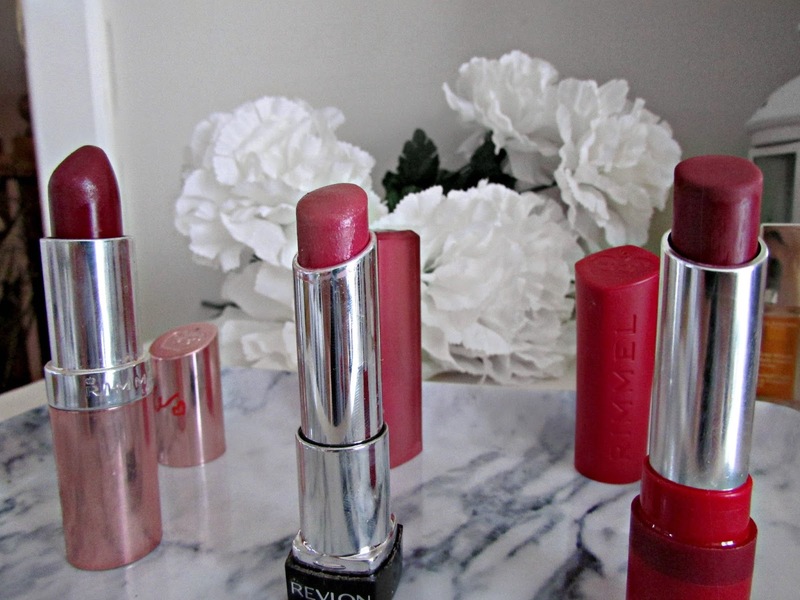 I'm going to kick things off by talking about three of my favorite lipsticks at the moment. As you can see they are all red. Going to be completely honest I'm not really a lipstick kinda person. I prefer lip butters or glosses however since working for British Airways part of the uniform code is to have a red lip. I've trialed and tested about 30 different lipsticks since I joined the company and I have tosay that these are definitely my top three favorite lipsticks to wear on a daily basis at work. Rimmel 'Retro Red' Lasting Finish Lipstick: This is one lipstick that I actually put of trying for ages. There was just something about it that just made it seem to daring for me. I had to go for it though because, well one, the packaging is just absolutely amazing, and two, the color of this lipstick is incredible. The packaging I believe was special edition to mark 15 years. I'm saying all this as it's what I can remember from their release but please don't quote me on that. The color 'Retro Red' is beautiful plum shade that will definitely suit all skin tones. I absolutely love how lovely the finish is. It's not matte but it's not a glossy finish either, it's more of a satin finish that doesn't dry out the lips which is a bonus for me as my lips get dry very quickly. If you're interested in this lipstick then head on over HERE to purchase it. Revlon 'Berry Smoothie' Lip Butter: If you have been reading my blog for a while then you will know that I always speak about this lip butter. It's one of my absolute favorite beauty products and I think I've mentioned it in every single favorites post I've done. Berry Smoothie is a beautiful burgundy red shade, that not only is perfect for this time of the year but it's also a shade that will suit everyone no matter your skintone. It's definitely one I could rave about forever but I will restrain from doing so. Hey, what can I say...I really bloody love this lipstick. If you're interested here's the LINK to purchase it. Rimmel's 'The Only One Matte' Lipstick In 810 - So this was a lipstick I definitely had a love hate relationship when I first bought it. As you can probably guess by my selection of lip products featured in this post I tend to go for something that has a glossy, satiny finish and this lipstick is the complete opposite of that. However, I saw so many other bloggers rave about it and I know a few people at work absolutely swear by this product so I bought it. Although it took me a couple of weeks to get used to it I now absolutely love it. I do find that this lipstick lasts longer on my lips than the others I have in my collection. I also find that even though it's a matte lipstick it doesn't actually dry my lips out which was is my biggest concern about matte lipsticks and why I don't purchase them often. This lipstick however I find is very creamy and smooth upon application and very comfortable to wear on your lips. You can check out this lipstick as well as view the other shades they have by clicking the link HERE. My next two favorite lip products are two products I use daily, morning and night, as part of my skincare routine. On no make up days these are the only two products I turn to as they are just amazing and do wonders for my lips. Clarins 'Instant Light Lip Comfort' Oil - This product is something I tend to use before bed as it's a product that is so deeply nourishing and non greasy. The difference in my lips is amazing. They are more nourished, healthy looking, they don't look chapped and as we all know this is the season of chapped lips. The scent of the product is also so lovely. It's a light honey scent which isn't too overpowering and just adds to the attractiveness of the product. I absolutely love it. I know that over the summer Clarins actually expanded on their range of lip oils. This one I've got is just a clear coverage on the lips whereas now you can get a few that add a little bit of color to the lips which I personally love the look of. I haven't had the chance to invest in them yet but I definitely will be saving up for a couple in the near future. If you're interested in any of the Clarins Lip Oils then I would recommend just heading over HERE to check out the other oils they have in the range. 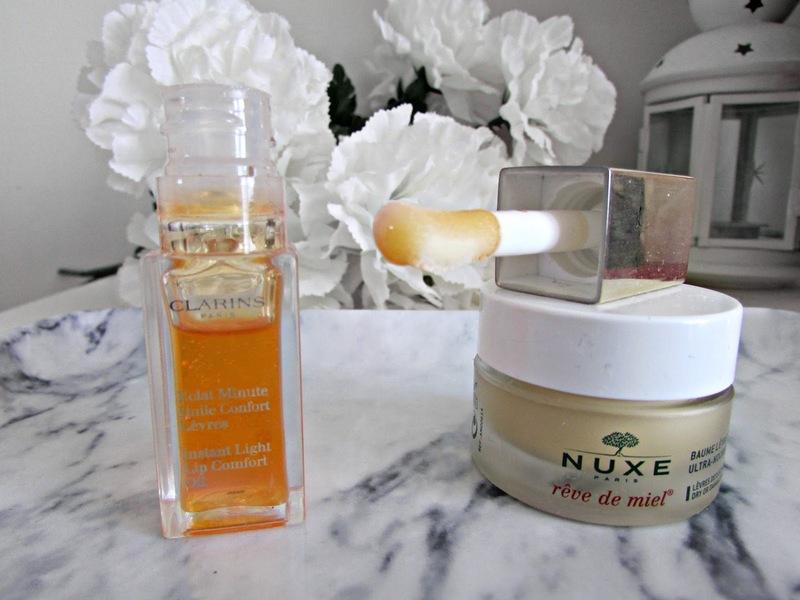 Nuxe Rev De Miel Lip Balm - One of my all time favorite lip balms and something that no matter how poor I am I always end up repurchasing as it always works absolute wonders on my lips. Most lip balms can be quite thin and glossy on the lips however this one is incredibly thick and matte on the lips. When I first bought it I was slightly concerned about how thick it was but then I realised this is obviously for a reason and that's to make your lips super moisturised and hydrated for the whole entire day or night. I never really use this lip balm in the day as I find it's too thick and I'd have to wait ages for it to sink in to the lips before applying a lipstick over the top so I tend to use this at night before bedtime an in the morning I always wake up with super moisturized lips. I think this lip balm is amazing and absolutely perfect for the winter months especially if you are like me and suffer with chapped lips I just think this will work wonders on you. If you're interested in this lip balm then head on over HERE to have a look. So there we have it, just a few of my favorite lip products at the moment and ones that I highly recommend everyone definitely purchases at least once as I can imagine all these products suiting everyone no matter your skin tone or type. If you have used any of these products below then be sure to let me know in the comments below your thoughts. If not, will you be trying these products in the future? Thank you for reading and I'll see you in my next post. Hey everyone! Happy Monday! I hope you all had a fabulous weekend and an amazing start to the week. I was working on Saturday but spent my Sunday in London with a few friends at a show one of the lovely boys from Collabro puts on once a month. It was amazing and after a long couple of weeks working away it was so lovely to just chill out, catch up with my friends and just spend the afternoon listening to amazing music and escape from the outside world for a little bit. It's something that always makes me so happy and today I've literally been so happy and smiling all day as it was such a buzzing atmosphere. It really was amazing. Anyway, enough rambling. Today I thought that I'd talk to you all about my current favorite tools to use as a blogger and I thought I'd share them here on my blog. I think this will be an interesting post for those of you who are quite new to blogging or who want to shake things up a little bit to make the whole blogging experience more interesting. I hope you enjoy this post. If you are a student then you probably already use this but if not even if you're just a blogger I think this little tool is just incredible. If you're a blogger who writes a post but then is worried about the grammar in it and get too scared to publish it (I used to be one) then this website is absolutely perfect for you. I was introduced to this by a friend when I was at university and I found it so incredibly useful that I haven't stopped using it since. If there's any spelling mistakes or anything like that within a text then this will highlight it which means you won't need to worry about the grammar nazis as you'll be able to correct it straight away! Win-Win! This is a bit of a sore subject with bloggers at the moment as picmonkey have recently changed their terms and conditions and it's gone from being an amazing free app to something that you now have to pay for. It's £9 a month which is pricey but I've actually cancelled a couple of subscriptions in order to pay for this app as I just think it's absolutely incredible when it comes to editing photos for a blog post or even for instagram. There are so many things you can do on there such as adding texts to images, brightening your photos, making them whiter, crisper and clearer etc. It's just got everything on there and I definitely think it's something worth investing in, for me personally anyway. Pinterest has always been something I have absolutely loved using. I think it's the absolute perfect tool for finding inspiration for absolutely everything whether it is inspiration for blog posts, outfit post, recipes, home inspiration, travel inspiration etc, it is all on there. It's definitely something I'd also recommend for driving traffic to your blog. It's something that I started to do at the beginning of this year and haven't really done much off recently but you really do notice a difference. Definitely one to check out. A new addition to my phone over the last couple of months is UNUM. Don't ask me to pronounce it because I have no idea however it is such an amazing little app for planning your instagram grid. I've stopped obsessing over having a theme on my instagram now as that took the fun out for me but I still love using this app to see if the photos will go well next to each other and whether or not they'll look good on my grid. It's definitely an amazing planning tool for instagram. Instagram in general is amazing. I know recently there's been more downs than ups when it comes to the apps but I personally find it amazing for finding out where things are from. I love that you can link and hashtag brands now in the story section and if you're following a bigger influencer many of them would have linked the product they are showing in their story with the swipe up feature. This is perfect for scheduling tweets on the go if you're like me and don't really get time when you're at work or out with your friends to check twitter or your blog and remind them of previous posts or to remind them of your bloglovin' link or any other tweets you can think of that you might want to schedule. It's not an app I use for everything, just to remind people of old posts but it's so useful if you want to keep your presence up on twitter. It's so easy and simple to use and definitely one of my most used apps. Okay so currently in my inbox I have 1100 unread emails. It is mental and you may be thinking okay shouldn't you be reading them? I mean the thought of doing that right now is definitely making me nauseous. However this app has been a lifesaver recently. What it does is basically unsubscribe to emails you might have previous subscribed too. Sometimes when you want to access a website or even when you tick that dreaded 'send me more information' box when placing an order you'll suddenly get twice as many emails appear in your inbox than you ever cared to have. This helps and you can definitely de-clutter your inbox. I've used it before and it is a lifesaver. It's definitely a place I'll be heading once this post is published to get rid of all those unwanted spam emails. An app for those of you who love creating and making lists like me. I absolutely love this app. I know there is already a notes section on most phones but I just find that for bloggers this works the best. There are so many things you can do. You can set reminders, draft up blog posts, take photos, create to-do lists and even chat on there as well if you have contacts on gmail. I absolutely love it and I think it's a godsend for bloggers. I never really use the notes on my phone as I just prefer to use this so much more as there's just a lot more you can do. Definitely something that's worth downloading. 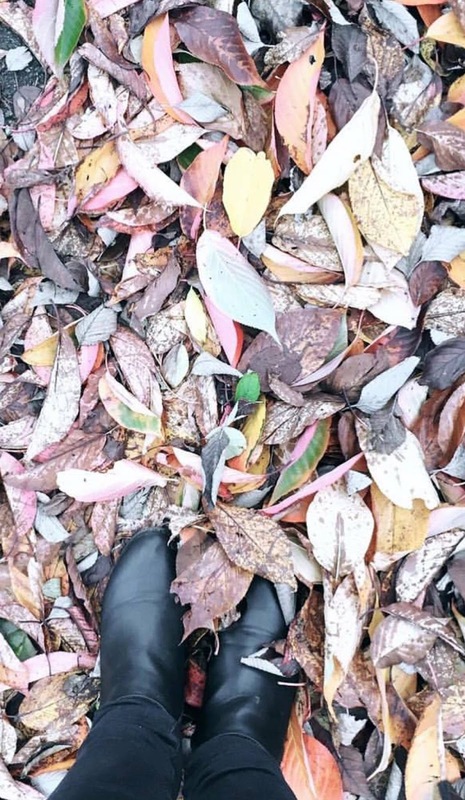 This is one of the most popular photo apps out there for bloggers and if you're a blogger reading this you probably already use this but if you don't it's basically a photo editing app. It has so many good features on it and it is an app that I use to edit all my instagram photos and even my blog photos some times mainly for when I don't really have the time to just sit in front of my laptop and edit photos. I tend to use this when I'm on the train home from work I just sit on there and edit them so they are ready to be uploaded on blogger. It's such an amazing app! 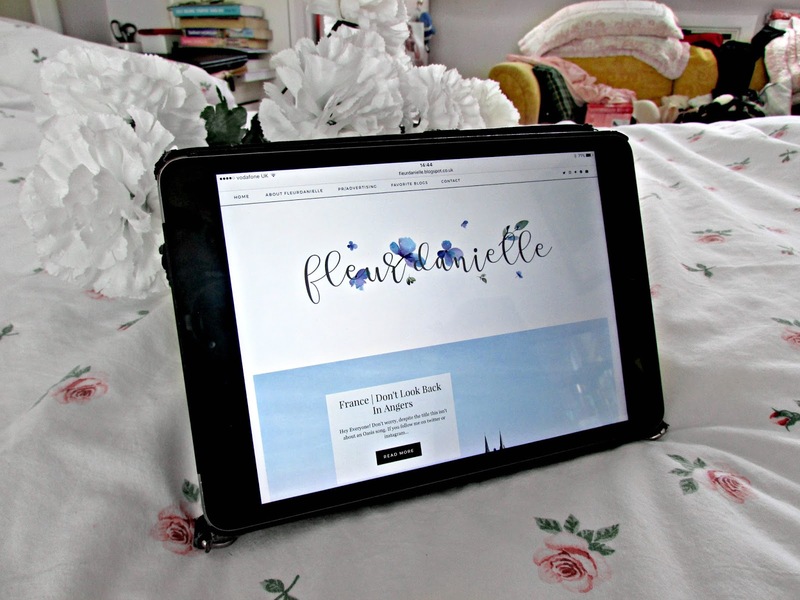 I've seen a lot of tweets recently from bloggers asking if anyone actually still uses bloglovin' and I'm here to say Yes!!! I don't get why people are stopping using it? It's the perfect place to find your blog posts in one place and you can also read you favorite bloggers posts as they are all in that one neat place. I think it's the perfect app if you haven't read a bloggers posts in a while and just want to catch up on them all. 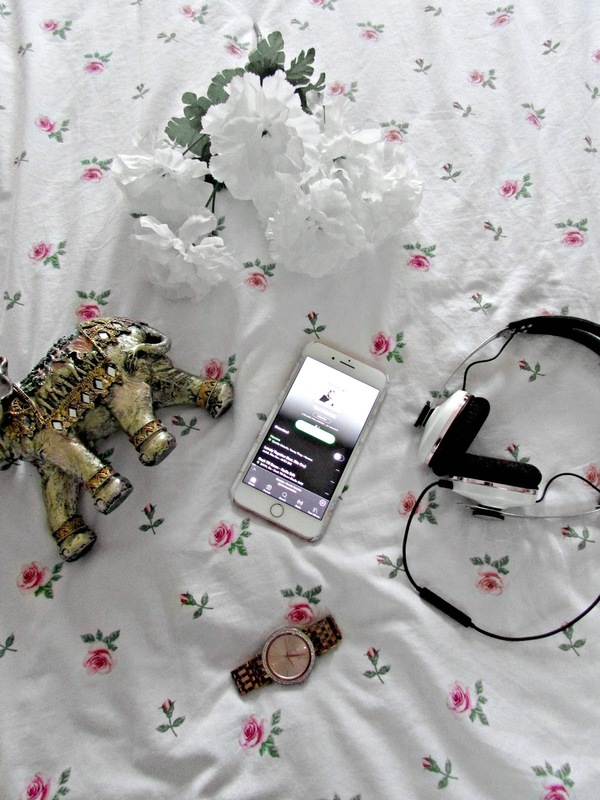 Bloglovin' is definitely the place to go. It also has different categories so if you want a travel post just click on travel, beauty post just click on beauty. I personally think it's an amazing website and something I hope I never stop using. So there we have it, just a few of my favorite tools to use as a blogger. If you're after new apps or you're perhaps thinking of starting your own blog then I hope this has helped. If you use any of these apps then be sure to let me know in the comments below your thoughts. Also let me know of any other apps, tools and websites that you perhaps use as I'd love to know more about them. Have a good day and I'll speak to you more in my next post!